Spurs Odyssey was this week (June 2010) invited to attend a gathering at the new prestigious Burger King in Leicester Square. Two of Spurs Odyssey's members - Peter Garnett ("Peej") and Tom Fisher ("Tommy") - went along and produced the following rather unique insight into my personal favourite ever football player. There�s something a bit surreal about walking to a Burger King in Leicester square to meet one of the truly legendary figures of English football. It becomes more so when you encounter two very attractive young ladies encouraging passers by to have a go at keepy-uppy to win a football. His playing career at the highest level started around the time I was born and when I first started supporting Spurs he was the top Johnny. I was particularly taken with the story that when he joined us from Italy he was priced at �99,999 because Mr Nicholson didn�t want his head swollen by being the first player to be worth �100,000. When he left us to join West Ham with Martin Peters coming in the other direction there was a genuine sadness tempered only by the arrival of a World Cup Winner who I had the pleasure of meeting when he turned up at the rose nursery that I was brought up on during a sunny Sunday afternoon shortly before we met Wolves in the newly conceived UEFA cup final. As it happened, being brought up on a rose nursery turned out to be a real blessing in disguise because that gave me my opening gambit, having told Greavsie what an honour and privilege it was to meet him in person, I was laughingly told to cut the b.s. and get on with it.�I think you know my dad.� I started, �He always maintained that he used to prune your roses some 40 years or so ago when you lived in Cranham (a small, village type place close to Upminster in Essex). He worked at Warley rose gardens�. With this Jimmy�s eyes lit up and he burst into life, �Ah yes, I bought loads of roses from there, in fact I�ve got a rose named after me which they helped to develop,� he seemed genuinely proud of the fact that he was one of the first people ever to have a new rose named after him, ��of course I don�t have as many now as I used to because I live in Gt. Baddow which is more woodland and less manicured� he went on. Apparently Jimmy�s a keen gardener and encourages �bio-diversity� - one of the modern buzzwords in gardening, meaning that areas are left rather unkempt to encourage insects which in turn encourages birds and other wildlife into the garden. �I�ve got areas to encourage bees, which are having a bit of a hard time of it at the moment, these guys don�t bother with all of the protective gear, they just open the hives and do whatever�� He had an authentic admiration for what they do and bemoaned the hundreds of thousands that beekeepers had lost in recent years. Inadvertently I�d actually achieved, at the first attempt, the goal that I had set myself, to uncover something about Jimmy Greaves that had hitherto not come out about the great man, I�d completely forgotten in the mists of time that he�d had a rose named after him despite the fact that it was a big thing for my father at the time and he went on about it at length. 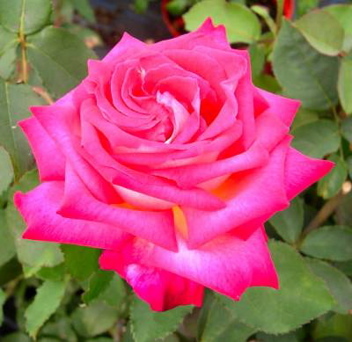 The Rose named �Jimmy Greaves� is ironically one of the developed hybrids that isn�t very bee friendly. If truth be told I could have spent the allotted time talking to Jimmy about gardens and gardening and I suspect he would have enjoyed talking about something other than football but since I was there representing Spurs Odyssey I�d have been remiss in my duties had I not asked him one or two football related questions. In a serendipitous echo he said �Spurs or Chelsea�, in the knowledge that I was a Spurs fan, he went on to say that he applauded what Harry had done for the club and that he�d never want to play �up north�, clearly a London boy which rather swelled my heart. �Who was the best player you�d ever played with/ against� I enquired. At this point he was distracted as one of the delightfully attractive young ladies who was enthusiastically getting people to try their luck at keepy-uppy outside was bent seductively over the lip of a large box containing footballs which were being handed out to winners. We were understandably drawn to enjoy the vista. �Sorry, where were we?� he apologetically got back on track, I reiterated the question, �Ah yes, well winning the Cup Winner�s Cup and the Cup Finals of course and playing for England - I can�t really give you one.� A predictable answer I suppose but that was another box ticked. Now for the thorny issue, �The word �legend� is much over-used these days but you are definitely one in any Spurs� fan�s eyes how come you�re not in the hall of fame?� I enquired. �I won�t do the dinner, they give you a cut glass sherry decanter and what good is that to me? I always thought that you�d be in there for what you did on the pitch but sadly that doesn�t seem to be the case. You should speak to Spurs about that because I�d be honoured to be in there but I won�t do the dinner.� I appreciated his frankness in giving a direct answer to the undoubted tragedy of him not being suitably recognised for his fantastic contribution to our club�s history. Lightening the mood slightly I started to bring the interview to a close. �What do you like in the way of music?� I asked ticking another box on my notes. At this point the PR people brought proceedings to a close because Jimmy�s eloquent talents were required for a radio interview so Tommy and I thanked him for his time, he shook our hands warmly and he was then was hustled off to his next chore. Fifteen minutes of wonderful memories had been delivered by one of my boyhood heroes. It was great to see him in such rude health and as affable, charming and outspoken as I remember him from his Saint and Greavsie days, a memory I will cherish forever.